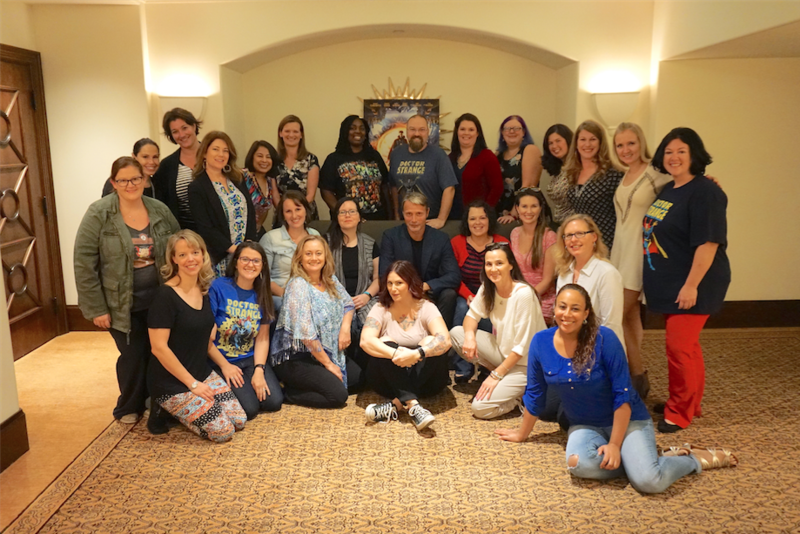 I joined a team of 24 other bloggers on a Disney press trip in LA and had the opportunity to sit down with Mads Mikkelsen to discuss his role as Kaecilius in the new MARVEL Doctor Strange film. It was such an interesting perspective from an actor who has played the villain in so many films. I loved it! 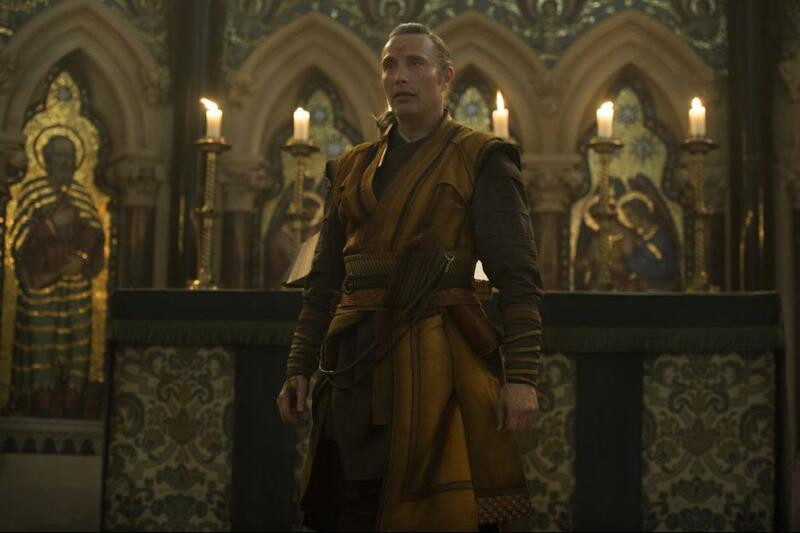 There was SO much information in our interview with Mads Mikkelsen so definitely stalk the #DoctorStrangeEvent hashtag on Twitter to see more perspectives and Q&A from other bloggers! Q: Will you be collecting yourself as a toy figure? A: I’ve been waiting 51 years for that so yes. A: I’ll take the villain. I mean, in terms of playing characters, I think that any good hero or any good villain has to be interesting…..having both sides of the coin. And I think that’s exactly what Marvel always does, right? Q: What did you think the first time you saw yourself in makeup, costume, everything? A: It was fantastic. We went to do some of the tests of makeup and I insisted on bringing the costume and wearing it when we do the makeup just to see how it looks together. They were spot on. 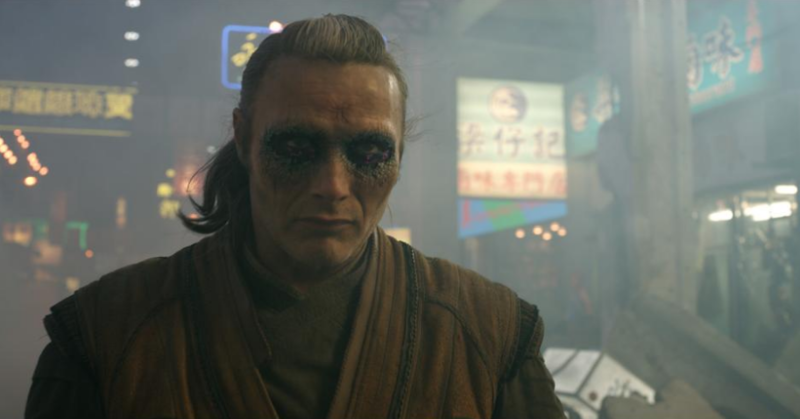 We were sitting in there for hours trying out this makeup, and I was like, “Oh god, do I really wanna do this every day?” But then it turned out so fantastic. Three hours every day, we’ll do it. It’s worth it. Q: Your costume itself seemed like it was pretty heavy with a lot layers, did that cause any difficulties? A: It was quite heavy. It wasn’t crazy heavy but it wasn’t light. Every day, the more you wear it, the stronger you felt. It felt featherlight by the end. But in the beginning it was like, are you serious? But the more we worked out with it the more it made sense. Q: How does it feel to not only have your name cemented in Marvel universe, but also the Star Wars Universe? A: It seems appropriate. It feels fantastic. As an actor who started out acting 20 years ago back home I never imagined that I would work in America at all, let alone that I would work in a Marvel film. So it feels as if I’m a very fortunate person. 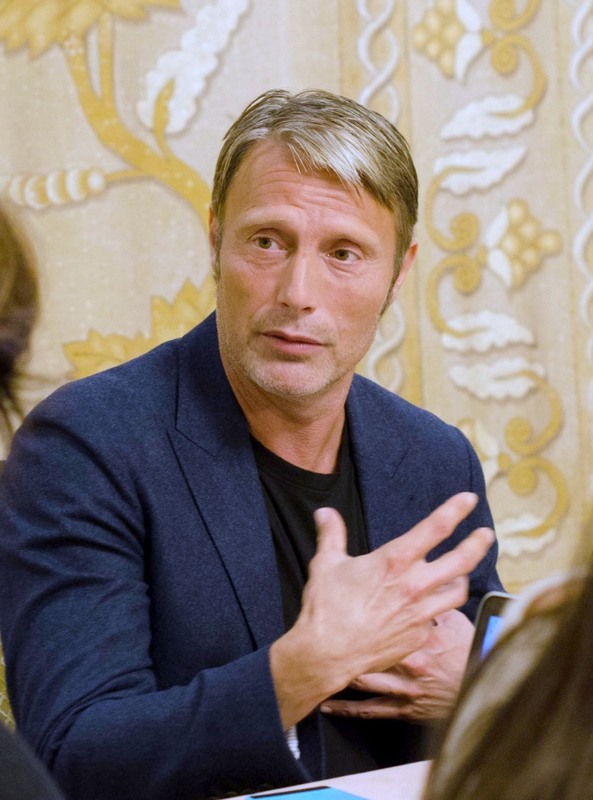 Q: Do you feel like you’re being typecast as a villain due to your phenomenal performance in Hannibal? A: Well, I am to a degree over here……but if the alternative is not to work over here I’ll take the villain. Uh. Luckily I do a lot of different things back home in Europe so I’m not starving in the sense of “why am I always the villain?” If it’s this kind of villain, I’ll take it any day. Q: How do you tap into being the villain? A: Well it’s obviously it’s in the script somewhere….. and you lean into the script. For me the script is always the most important tool and from there I’ll develop the character with the director, of course. Q: Can you explain a typical day on set for you? A: A typical day, because of the makeup, would start at five in the morning, or there about….and depending on where you’re staying in the city. I was smart enough to move to Windsor, so I had 20 minutes as, as opposed to two hours, right? And then you go to set, and you sit in a chair for three hours, and you meet the other guys, and you talk about what we’re supposed to do, or we’re about to do. I probably smoke a cigarette, and we go in and work. And then I go home at six, seven, eight in the evening. Q: Is there anyone particularly who has influenced you in your villainous roles? A: Yeah. I think that, not to compare at all, but some of my favorite actors have been playing villains as well. Christopher Walken is a hero of mine and I think he has the ability to somehow make the villains likeable. Whether it’s his personality or that he chose a part that was dualistic written so it makes sense, I don’t know. The joker is a fantastic example. We love to hate him, you know? Q: What’s the most challenging scene emotionally and physically? A: Well, that would be the scene where we did that fight sequence for three weeks. It’s probably eight or 10 hours each day, you know, fighting each other every day. And you do hurt the next day. Q: Did you have a favorite Marvel superhero as a kid? A: Spiderman was easily accessible. It was: he’s a kid, and he’s fun, and he can do stuff, that’s cool. So I think that was easy to identify with as a kid, right? A: It’s Marvel. Scott was pitching on the phone the story, and then I remember he said “And then it’s a lot of Kung Fu stuff, flying……but don’t worry, we’ve got stunt guys for that.” I was like, “Wow, wow, wow, hold on, what’d you say?” “We’ve got st-.” “No, no, rewind back, Kung Fu, I’m on.” So, it’s like Marvel and flying Kung Fu…..I think that could be a yes. I’ve always wanted to be Bruce Lee when I was a kid. I had to wait until I was 51 years old to be a slightly older version of him, less good of course. But it was fun. It was something I’ve always wanted to do since I was a kid. Q: When researching the character and creating the character, what were your motivations, what were your influences there? A: As I said before, the script is the bible. This is where the character, he is in there somewhere together with the director. We can approach it different ways. I think inspiration wise, like all good religious leaders, all political leaders…..they have a sense, an ability to speak to the people in the way that they understand. And if you look at this character with his his mask on you would also say that. He has a point. He’s saying stuff that makes sense to a degree. He wants to make the world a better place but has different means to get there. But he still has the goal of making the world a better place. As with all good dictators, it takes some sacrifices, right? 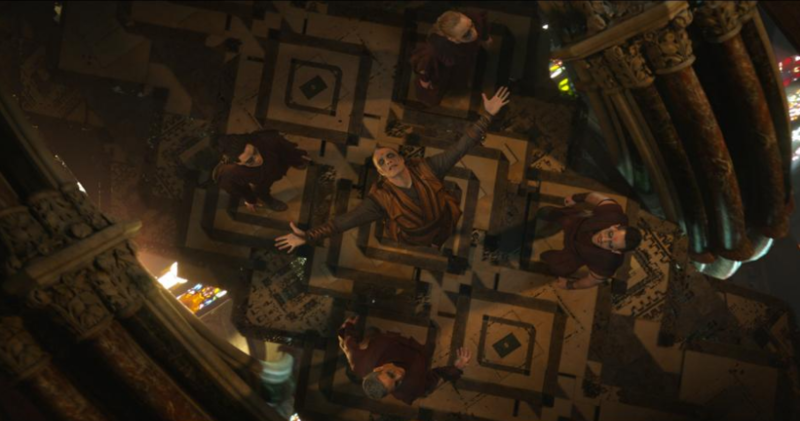 Have you seen the Doctor Strange trailer? Check it out below & let us know what you thought when you see it in theaters on November 4th!